An incredibly unique experience can be found at Esalen, seated between glorious mountains and the Pacific. Spend anywhere from a weekend to a week exploring mind body and spirit through a wide variety of seminars, workshops and classes. Or, create your own Personal Retreat visiting and indulging in and sampling all Esalen Institute has to offer. 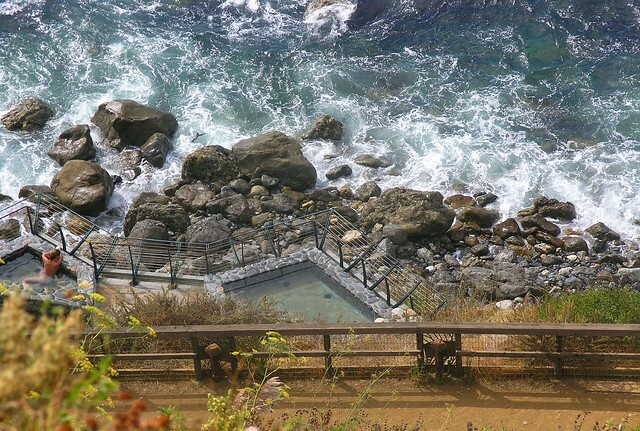 From yoga, meditation, bodywork and of course, hot springs, Esalen has 27 acres of beauty enhanced by the ocean spray. Come with an open mind and ready to fully rejuvenate one’s soul. Acres of nature’s bounty encompass this amazing retreat. Natural geothermal mineral water is guided into beautifully crafted hot pools where one can soak up the ocean views while relaxing the soul. There are also additional hot spring baths indoors where one can choose either the “silent” or “quiet” side. Towels are provided, and all spring and massage areas are clothing optional. Esalen Institute is much more than simply the hot springs, it is an experience to relish, to expand one’s spirit and remember forever. Hot pools are available to the general public from 1:00 a.m. – 3:00 a.m. for $20 per person. Reservations must be made in advance for those staying overnight and participating in the Esalen experience, and for those who wish to enjoy the wonders of the hot springs. From cliffside views to a rustic feel, typical Esalen Institute accommodations are a shared environment. They do offer a variety of types of shared areas, as well as some individual rooms. They strive to house couples in their own space. One can also pitch a sleeping bag with others in one of the meeting rooms, camp out in a bunk bed style dorm or enjoy one of the Point Houses. Amenities vary for each accommodation. The shared living experience enhances the sense of community among those staying at Esalen. Meals and workshops are included in the rate, which varies depending on the length of stay. Indulge your palate in traditional, vegetarian or vegan cuisine. Esalen Institute is 45 miles away from “civilization”. There is no cell phone coverage, but limited wifi is available in the lodge. Camping and RV spots are not available for overnight accommodations. Esalen Institute is approximately 100 miles north of San Luis Obispo. If traveling from the south, take Route 101 north to San Luis Obispo, then Highway 1 to Esalen. Continue on to Lucia, follow the bend in the road by the restaurant and motel, which puts you at about 10 miles south of Esalen. Keep going and look for the Esalen Institute sign!